Kharantsy village, boasting a viewpoint on the shore of the Maloye More from where you can see Lion (‘Lev’) island and Crocodile (‘Krokodil’) island. Peschanka, where you will find beautiful sand dunes all along the shore. After the Second World War there was a labour camp here and you will see some remains of this, along with good views of ‘Poklonny Krest’ (or ‘Memorial Cross’) Mountain. In the warmer months this becomes an ideal swimming spot. Three Brothers Cape, a marble cliff-face covered in red lichen. Cape Khoboy (from the Buryat word for ‘tusk’), the northernmost tip of the island. 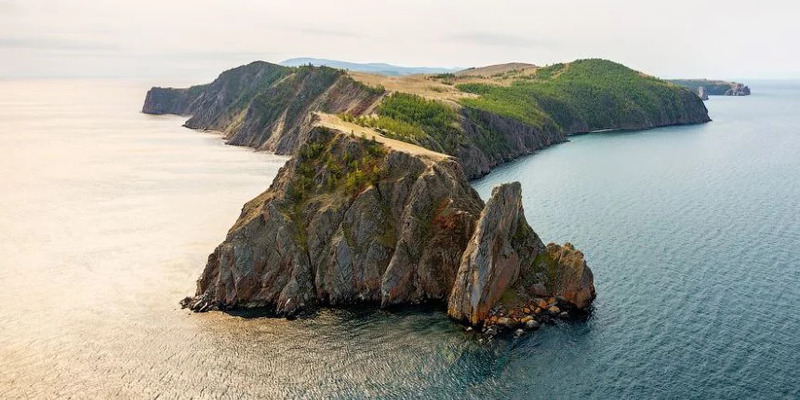 This is one of Baikal’s sacred sites, and it is here that the Bolshoye More and the Maloye More (or the ‘Big Sea’ and the ‘Little Sea’) come together. There is a real sense of openness here, with theseemingly endless, calm blue waters of Baikal stretching out languidly in front of a distant backdrop of mountains and the Sviatoy Nos peninsula. If you’re lucky you may spot some nerpas (Baikal’s freshwater seals) splashing about in the water here. Cape of Love (or “Khunte Levy” in Buryat), a picturesque cliff in the shape of a heart. Uzury village, on the northeastern side of the island and home to a small weather station. You will now be looking east over the Bolshoye More, and there is easy access down to the water here. ​Lunch: a campfire picnic of traditional hot fish soup (or “ukha”), with cheese sandwiches and tea and biscuits. ​This route is longer than the excursion to the north of the island, with longer stops as well as better roads. These roads will take you up into the hills, from where you will be able to enjoy expansive views that take in both the Bolshoye More and the Maloye More. ‘Polevoy Stan’, a viewpoint looking out over a beautiful vista of the Maloye More. Yalga Lake, Olkhon’s largest lake which warms up in the summer months and becomes a lovely swimming spot framed within a picturesque steppe landscape. The lake is separated from the Maloye More by a natural spit of sand. ​​Lunch: a campfire picnic of traditional hot fish soup (or “ukha”), with cheese sandwiches and tea and biscuits. 1. Ogoy island and the Holy Spring – 80 km, 8 hours. 2. Zama and Zunduk – 9-10 hours. 3. Combined excursion to Cape Khoboy by land and sea (van and motor boat) – 70 km, 9-10 hours. 4. Evening boat trip – 20 km, 2 hours. 1. Ogoy island and the Holy Spring, a popular triangular route which includes a beautiful crossing over to the other shore of the Maloye More. 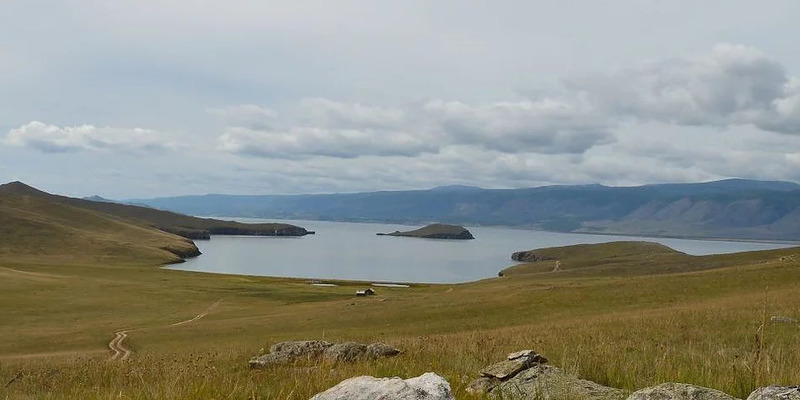 En route you will pass some of the Little Sea’s islands, among them Ogoy island where you will stop and have the chance to take a closer look at the stone Buddhist stupa. The sacred springs are on the other side of the Maloye More, in the woods about 3 km from the shore. Local people believe that the waters from these springs have healing properties. Lunch: Traditional hot fish soup (‘ukha’) with cheese sandwiches and tea and biscuits. 2. Zama and Zunduk, a true expedition, and not one for the faint-hearted! You will spend half the time on the water and the rest of the time hiking through mountains on the mainland with the help of a guide (included in the cost). You will not come across any villages or signs of civilisation on this journey, and you will spend the whole time out in Baikal’s raw nature. Zama – a place of unspoilt natural beautywhich is on the mainland, to the north of the Maloye More. There is a natural spit of sand here which creates a lovely warm pool for swimming in. Zunduk – a cape to the north of the Maloye Morewhich takes its name from the Buryat word ‘zogdok’, meaning ‘ridge’. We would advise against any children, pregnant women, and people with mobility difficulties from embarking on this trip as the route here runs along the very top of a tall steep cliff-edge, making this a tricky hike. Once you have passed along the cliff-edge a wonderful view of Cape Khoboy and the north of Olkhon will open out in front of you. Lunch: a campfire picnic of traditional hot fish soup (or “ukha”), with cheese sandwiches and tea and biscuits. 3. Combined northern route by land and sea – Cape Khoboy by minibus and motorboat. An unbeatable opportunity to see some of Olkhon’s highlights from the water and on land. The minibus route will take you to all the stops on the Northern excursion by van. At the village of Uzury you will then board a boat and continue the journey on water. If you’re lucky, you might see a nerpa (or two!) at Cape Khoboy. ​4. Evening boat trip – endless sky, the gentle lapping of waves, the shore slowly swimming by….a chance to relax on the water and enjoy our incredible sunsets! 1. Kharantsy (on foot or on horseback), 10 km. 2. Trety Kliuch (‘Third Spring’) (on foot or on horseback), 18 km – one leg could be covered by car. 3. Polevoy Stan (on foot or on horseback), 5 km. 1. Kharantsy– this route takes you along an incredibly beautiful sandy shore and then up onto a rocky cliff face, and then through an enchanted forest and out into the hills. There is the option of returning to the homestead by car. ​2. Trety Kliuch (one leg by car at a cost of 500 rubles) – this is a three-hour trip on a lovely woodland track along a stream. You will pass the ‘first spring’ in a beautiful meadow with the remains of an old enclosure. The track will then climb up to the ‘second spring’, which gurgles out in a creek about 8 metres below the track. The ‘third spring’ is in a wide clearing in the woods. There is plenty of access to water and firewood at all times. ​3. Polevoy Stan– a great place to enjoy breath-taking views of the Maloye More and the village of Khuzhir. 4. Saraysky ring– a track that runs along Saraysky beach which abounds with many of Lake Baikal’s endemic species of plants, animals and birds. This track is currently being constructed, but this should not get in the way of you enjoying Olkhon’s natural wonders. This is an opportunity to see the life and ways of a Buryat family, and to get to know other aspects of Buryat culture such as wrestling (the national sport), folklore, traditional crafts, livelihoods, customs and beliefs. The neighbouring village is home to a unique open-air museum where a guide will take you on a fascinating tour and be ready to answer any questions. The residents of the village will be selling dairy produce from their own homesteads: milk, sour cream and ‘tvorog’ (similar to cottage cheese). It is also highly likely that you will have the chance to try some ‘tarasun’ – a traditional alcoholic drink made from milk. You can return to Nikita’s homestead on foot along the beach or by car.